Offering a credit recovery option to students can help schools and districts increase graduation rates, adhere to the federal Every Student Succeeds Act (ESSA) graduation requirements, decrease dropout rates, and even address chronic absenteeism. According to a credit recovery brief published by the U.S. Department of Education, “High-graduation-rate schools were more likely than low-graduation-rate schools to offer at least one credit recovery course.” Retaining students in the district and making sure all students graduate is something all administrators strive for attaining. Let’s explore five ways Odysseyware® allows for flexibility in providing a credit recovery solution. CRx and Flex CRx Modes promote personalized and accelerated credit recovery courses. Why make a student take an entire course over if they don’t have to? Instead, let’s enable students to complete the work at their own pace and focus on just the concepts they have not yet mastered. 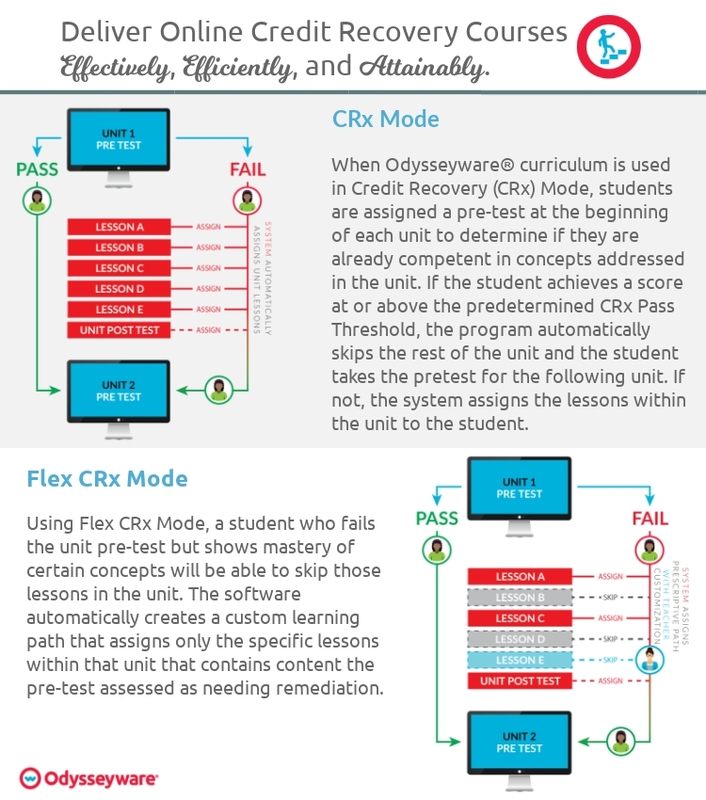 Odysseyware leverages two flexible options for schools to meet the needs of each student seeking a personalized credit recovery option: CRx Mode & Flex CRx Mode. Options to customize all credit recovery courses to match the initial credit courses offered within the district. The ability to differentiate the learning experience for each student is a foundational principle of the Odysseyware instructional design. Whether you need to customize courses to align to your state, district, or school scope and sequence, or need to customize to further meet the individual needs of a student beyond CRx Mode, Odysseyware makes that possible. All courses are fully customizable, so teachers can rearrange/remove content, add lessons from another Odysseyware course, and/or add their own unique web-based content. Intuitive dashboards that focus on metrics that are most important: overall performance and progress. Educators can easily monitor student progress, grade student work, and communicate with their students through our intuitive dashboard. The dashboard provides powerful visual reporting features—including a new Score-to-Date report—to support teachers and administrators. With access to a robust set of reporting options, educators can see individual or group activity, as well as progress, providing valuable information to make decisions regarding course or program modifications. The ability to give students anytime, anywhere access. Odysseyware curriculum can be delivered in a number of flexible options and a variety of settings. Schools can decide to leverage Odysseyware as an entirely online solution, blended learning model, after or before school program, in a computer lab, an alternative program, or even over the summer for summer school. For students who benefit from learning outside of a conventional classroom setting, Odysseyware offers opportunities to maximize learning time. At Moreno Valley Unified School District, some students enter their adult education program (offering credit recovery) looking to avoid situations involving bullying, while others are working through anxiety or other health issues. Participation in athletics and other extra-curricular activities provide motivation and successfully balance academics in this program. Through the program, MVOA was able to increase their graduation rate 404% and their dropout rate decreased 72% in three years. Technology is another unique attribute of schools. Not only do schools have varying technology, but so do our students and parents. All Odysseyware courses are built on a single platform, providing a consistent experience. Additionally, all content is fully HTML5 and Java-free, leading to improved ease of use as there are no plug-ins or add-ons required. Content can be accessed across browsers and devices such as tablets, Chromebooks, and smart phones, and has one of the smallest bandwidth footprints in the industry. In fact, almost 2.5X less than another leading solution, while at the same time providing a solid balance of media and text. The ability to support students through scaffolded instructional support tools. Vocabulary/Reference: Definitions and correct pronunciation of key academic vocabulary are provided at the beginning of every lesson. Students can look up background information and context about any words or phrases. Translation Tool: Any selected words or phrases included in the lessons can be translated into 23 languages with audio support. Text-to-Speech Audio Supports: Six different voice readers are available at six fluency rates. Students can follow along with automated highlighting and tracking of words as they read. Teacher and Students Notes: Students can take notes within the context of the lesson, adding interactive color-coded sticky notes, promoting informal writing and annotating text. Teacher notes can be added as additional scaffolds. Notes can also be printed and used as study guides. Message Tool: Students can virtually raise their hand and communicate with their teacher using the message tool at any time, as well as the “Ask for help” tool embedded within assessments. Writer Tool: Applies six proven writing analysis indices for accurate scoring and feedback on topic consistency, grammar, spelling and word count. Direct Instruction Media: Short (2-3 minute) direct instruction videos provide students with step-by-step guidance in the conceptual understanding of key skills, impart background knowledge, and place concepts into real-world context. These videos follow a social media type approach, allowing students to fast-forward, rewind, and play them as often as needed. Video Transcript: A text transcript is available for embedded instructional videos, which can be translated using the Translation Tool. Odysseyware has been helping thousands of schools across the nation in their quest to decrease dropout rates, increase graduation rates, and provide credit recovery options for students needing to get back on track. Since implementing Odysseyware, schools like Moreno Valley Online Academy have seen a substantial improvement in its graduation rate for credit deficient students, as well as a sizeable decrease in its dropout rate. Are you ready to learn how Odysseyware can help your school with increasing your graduation rates and credit recovery strategy? Engage with an Odysseyware expert today to discuss how we can help you give students the ability to earn credits for failed or incomplete courses without having to repeat the entire course!